Spectre’s Engine Dress-Up Kit was designed for the ’58-’86 Chevrolet small block 265-400. 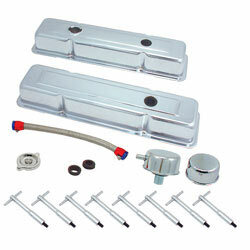 This kit includes: stock height baffled covers, chrome T-bar hold downs, chrome PCV breather, chrome breather, chrome oil filler cap, grommets, and a stainless steel braided PCV hose with red/blue Magna-Clamps. Designed for use with OE specifications for fit and function, Spectre products are engineered to perform as good as they look.